I first upgraded the bork3d engine to support all the iOS resolutions on the Windows side by reading the platform/orientation from an ini file to test multiple resolutions and platforms without needing to recompile the code. I decided to break the porting into two parts, first to iPhone 4 which would just used the 2x resolution textures from the Xbox 360 version while increasing all the original iPhone version location coordinates by 2x. The second part would then be tweaking the positions to maximize the screen space for the iPad. To deal with two sets of textures I created a second set of directories called “Textures2x” and “Fonts2x”. The iPad and iPhone4 versions both used the “2x” directories, while the original low-res iDevices use the original directories. I also added some code, mostly during initialization that fixed up sizes and coordinates depending on the device. For iPhone4 things were just 2x the regular iPhone size, but for iPad I kept texture sizes the same (2x like iPhone4) while pushing out HUD elements to the edge of the screen. 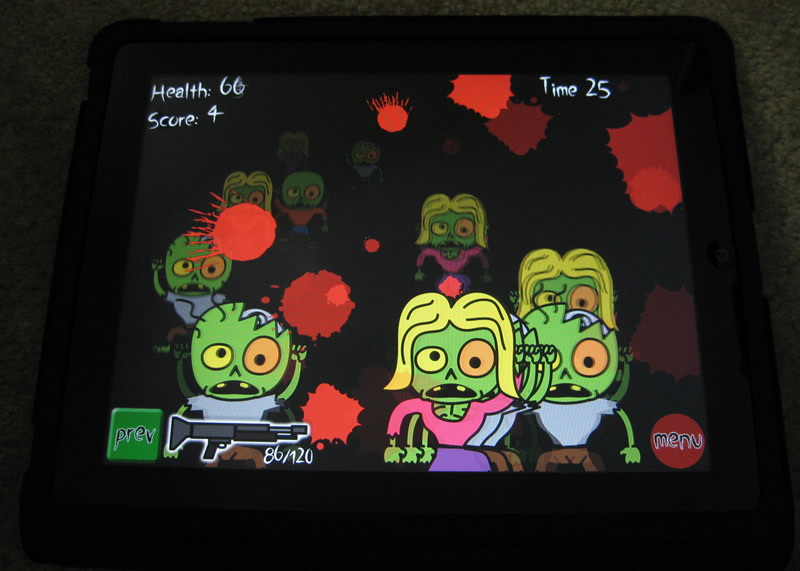 I also tweaked the zombie movement speed to be relatively the same for all platforms. Being able to do most of the work in Visual Studio on the Windows side made the process much smoother. It took some extra code on the XCode side to detect the proper platform and also scale the touch coordinates if the code was running on the iPhone4. The only major-ish issue I had was with the way audio files were loading stopped working on OS4 and I had to recode the loading functions a little bit to make OS4 happy. Now that I have been through the process, I hope to natively support all iOS devices for future games. But it also helped lay down a foundation for supporting even more resolutions in the future for platforms like Android and Windows Phone 7.